← What Were the Chiefs Doing? This is the first section of our guide to calculating player value in fantasy football. Each part will lay out a different aspect of the process. Parts II, III, IV, and V will be published on our blog throughout the week. Every year, millions of fantasy football owners spend months agonizing over their teams in pursuit of that one elusive championship. On this noble quest for fantasy glory, an owner must make a host of decisions that greatly impact their team’s performance. Each of these strategic choices boils down to maximizing one thing: value. The owner that drafts, trades for, picks up, and starts the most valuable players has the best chance to win. But determining a player’s fantasy value is not an easy task. If it was, you would be spending a lot more time with your friends and family instead of reading articles like this one, and Mathew Berry would have to go back to writing Crocodile Dundee sequels. In an effort to promote stronger social bonds, this series will aim to make managing your fantasy football team easier. I’ll realize these lofty aspirations by establishing a novel approach for assessing fantasy football player value and explaining how to implement it on your road to the title. By laying out the whole process, I hope to give you a comprehensive understanding of everything you need to know about value in the fantasy football player universe. That way, you won’t just know that Adrian Peterson and other studs are way, way undervalued, but you’ll know why they’re way, way undervalued. Now that I’ve told you the big news about AP, don’t go jetting off to repair your neglected relationships. Fantasy is more important than friendship. And my self-esteem really needs the page views. So… we’ve established our ultimate goal for this series: to create a new, more effective system for valuing players in fantasy football. I guess that means it’s a good time to actually explain what this system is. My technique starts with the idea that the performance of players in previous years is a good barometer for what to expect from players this year. Using the last five NFL seasons, I’ll examine the relationship between players’ preseason expert rankings and their actual in-season fantasy value. This data will enable me to build models that predict the value of similarly ranked players this year, and place an expected point total or auction price on every player from the first-ranked quarterback to the fiftieth-ranked running back. This process sounds straightforward enough, but it gets complicated when we need to decide exactly how to measure fantasy value. If we don’t get this measurement right, our results will be misleading, because we’ll be predicting something that looks like value, but isn’t. That is why this system’s efficacy hinges on its ability to calculate fantasy value in a way that more accurately portrays each player’s contributions in comparison to other methods. From here on out, we’ll call this new value measurement technique the “objective-weekly” approach. This approach starts by taking the last five NFL seasons and calculating every player’s weekly fantasy value. We then sum up these weekly values to get each player’s full-season value. Next, we use expert pre-draft rankings to model these seasonal fantasy values, and find the expected seasonal value at each pre-draft ranking. Now, all we have to do to get to our final draft pick valuations is make some adjustments for free agency and other quirks of the fantasy football rulebook, and we’re done. This doesn’t sound too crazy (or maybe it does, who am I to judge my own sanity), but the objective, weekly nature of this system actually deviates a fair amount from what most major websites use. Let’s examine what the prevailing practices are, how they differ, and why they fall short. In opposition to the objective weekly approach, we find what I like to call the “seasonal-subjective” approach, which seems to be the most popular technique out there. The seasonal-subjective approach starts with relatively subjective full-season player projections from experts. The experts then take their raw projected point totals for each player and adjust by position, usually subtracting the projected points of the worst starter at the position of the player in question. In this way, they get a value measure that tells them how many points more each starter was worth than the worst-case alternative. This worst-case player is known as the replacement level, and using him to adjust for position scarcity is a good way to measure value (One that we will also incorporate later). So what’s the problem with this method? It seems pretty simple and it leans on some strong concepts. Well, as you might have guessed from its name and my skepticism, the subjectivity of the projections and the seasonal basis of the value calculation are big obstacles. It’s important to understand why an objective projection beats a subjective one and why a value calculation that starts with weekly performance is more accurate than one that starts with seasonal performance. Let’s start by looking at the difference between an objective system and a subjective one. Many of the expert staffs that make fantasy football projections have a wide range of skills that they utilize appropriately to help with their jobs: communicating ideas clearly, breaking down game film, interpreting coach-speak, synthesizing local news sources, getting yelled at by Skip Bayless…. The list goes on. Subjective player projection is not one of these things. Though they may try, it is impossible even for experts to remain unbiased when making subjective predictions. This is true not only in fantasy, but in almost any arena that demands gut-call predictions of an uncertain future. Different experts will all have different biases about certain types of players, which will unavoidably affect their judgment. Not only do they suffer from varying individual biases, but almost all of them fall prey to a particular foe: the lure of optimism. ESPN projects the average top 25 quarterback to improve by a whopping 75 points, while Rotoworld projects him to improve by a still far-off 28 points. For ESPN’s projections to be accurate, every top 25 quarterback would have to improve by an average of 875 yards and 10 touchdowns. This doesn’t pass a sanity check. Rotoworld is closer, but still not in the realm of feasibility. I mean, I know the NFL is getting more pass-heavy, but unless teams start running up NFL Blitz-style scores, this obviously isn’t happening. Even if the experts are too optimistic, you might think that relative player values will stay the same, since every player gets a bump. This isn’t the case though, because while the ordering of quarterbacks won’t change, the spread between them will. If you take another look at the chart above, you’ll notice that the difference between the 1-5 QB’s and the 20-25 QB’s is 58 points higher in real life than in the ESPN projections (and 35 higher than Rotoworld’s). The experts underestimate the overall gap between good and bad fantasy quarterbacks. This matters, because it is the spread within each position that determines the value of its players. Between this systematic issue and case-by-case bias toward individual players, subjective projections can create a very warped value measurement. I know it already looks like the websites using subjective projections are in trouble, but just wait until we talk about the issues with the seasonal aspect of their method. The seasonal method ultimately falls short because it reduces a player’s contributions in a complex game to one simple number. If fantasy rosters locked in August, you could just forget about your team until December, find out how many points each of your players scored, and have a pretty clear picture of what happened with your team that year. Everything would be fine (and pretty boring). But we all know this is not the case. Fantasy football is a complex game played on a week-to-week basis, so it shouldn’t be surprising that value needs to be calculated in a sophisticated way to reflect this sophisticated format. There is weekly variation in each player’s outlook caused by injuries, matchups, and byes that you just don’t capture if you start with a player’s point total for the season alone. Everyone knows that these short-term effects are real, but they might not realize why it makes a difference. Let’s start with an example from a fictional ten-team standard league. It’s the preseason, and you want to calculate the expected value of your starting quarterback, Ben Roethlisberger. Conveniently, your seasonal approach fantasy football tutor has some advice ready. He tells you to subtract the amount of points that you expect Ben’s hypothetical replacement to score from Ben’s projected points. This will enable you to see how many points Roethlisberger is going to gain for you, he says. Right now, you have Big Ben as the eighth ranked quarterback, projected for 260 fantasy points. You have Eli Manning ranked tenth, projected for 240 fantasy points. Being the tenth quarterback and worst projected starter, Eli is your hypothetical replacement. So for the whole season, Ben should be worth twenty extra points over replacement using the seasonal approach. 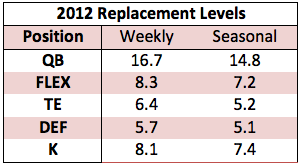 This trend of higher weekly replacement levels holds across the other years in our study too. The higher replacement level causes mediocre players to depreciate, while elite players gain value, so this distinction has a significant effect on how we view value at each position. Once you understand how these two types of replacement levels work, it is clear that the seasonal approach does not accurately reflect value under the standard format of fantasy football, and that ignoring this issue leads to an incorrect evaluation of the whole player pool. If you’re eager to find out exactly how this method changes player values from what you’re used to seeing on sites like ESPN or Yahoo, you can always skip ahead to the chart at the end (Part V). As for everyone else… Speaking as a completely unbiased party, I think I’m pretty trustworthy. But if you’re not into blindly accepting stuff some random guy on the internet told you without any explanation, I’m looking forward to spilling my fantasy football soul over the next however many pages. We’ll kick things off tomorrow by talking about how to calculate weekly value in Part II. Now, if you’ll excuse me, I have some waiver wires to scour. This entry was posted in Fantasy Sports, NFL Football and tagged Fantasy Football, Fantasy Value Handbook. Bookmark the permalink. How can i view your player projections ahead of time? I would really like to see how your list differs from the espn experts. I have drafts on tuesday and wednesday this week and your projections would be a big help. I concur. My draft is Wednesday. If you post the ratings early, I promise to still read the methodology articles. Hey guys, I’m posting part two tomorrow, and I’ll include a chart of auction values for a standard league at the end if that will help. Is there any way you can post the chart today? I have if its complete? My main draft is tonight and im the number 2 pick…im struggling with my first few rounds and could use the assist from your strategy if possible. Thanks for all you do! 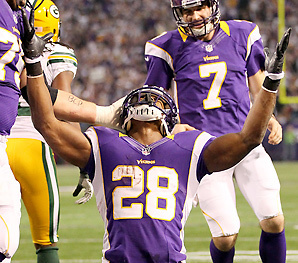 If Adrian Peterson was white, would you have still called him “Purple Jesus”. Probably not. (Since Black Jesus is a known construct) Hence the joke. In the last paragraph it says we can skip ahead to Part V if we are eager to see, where is that an option?